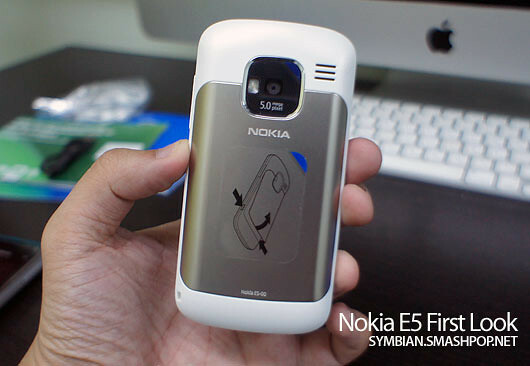 Nokia has recently launched a new Eseries to replace the E63 that caters to the mass market. Overview of Nokia E5: Connect seamlessly to the people in your professional and personal lives through instant messaging, email and your favourite online social networks. I just got it yesterday and before I start using/reviewing it, here are some photos and video of the unboxing. I realised that the packaging is quite compact and is made of recyclable material. Eco friendly. Nice. The package comes with manuals, earphones, battery, USB adapter/charger, OVI booklet and the Nokia E5 itself… pretty standard. The E5 has 5 colour variations; Carbon Black, Chalk White, Copper Brown, Silver Grey, Sky Blue.. this one I have here is the Chalk White version. 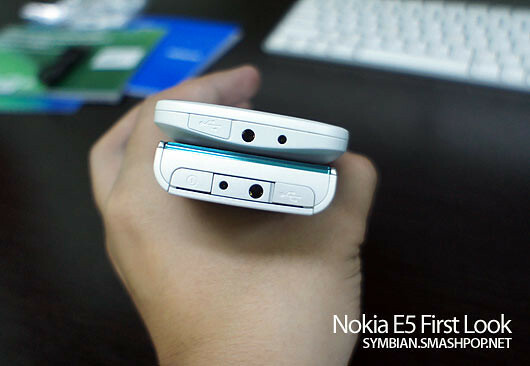 It has a 5 megapixel camera with zoom up to 3x (digital) & an LED flash. One of the drawbacks is that there is no autofocus. 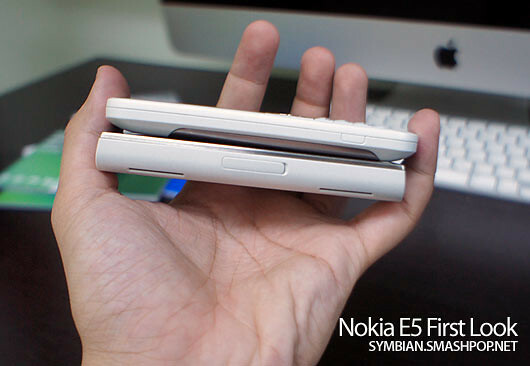 Thickness compared to an X6. The E5 screen is 2.36″ with a resolution of 320 x 240 pixels (QVGA) & supports up to 256,000 colours. - Get work emails in real time through Mail for Exchange and IBM® Lotus Notes® Traveler. - Stay close to your friends on Facebook – view their status and send a message directly from your contact list. - View and edit Microsoft Word, Excel and PowerPoint documents using the Quickoffice application. OK More features and reviews will be up soon. 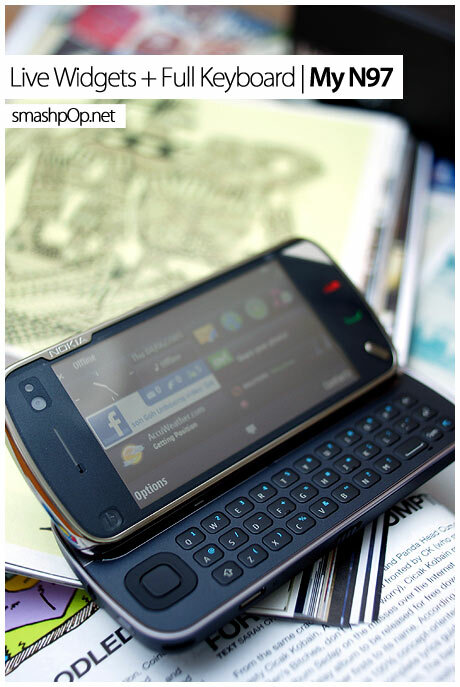 The Nokia E5 is now available at all stores for only RM830. Very very affordable for a device with such features. As some of you know, I’ve got the N97 yesterday… woot! I’ll be posting some detailed thoughts on it soon. Today, let’s just keep things simple. Unboxing the Nokia N97. Oh by the way, I took some shots of it and posted them on smashpOp.net. Do check it out. There are many little things Nokia added to the N97 that suprised me. I’ll talk about it soon. 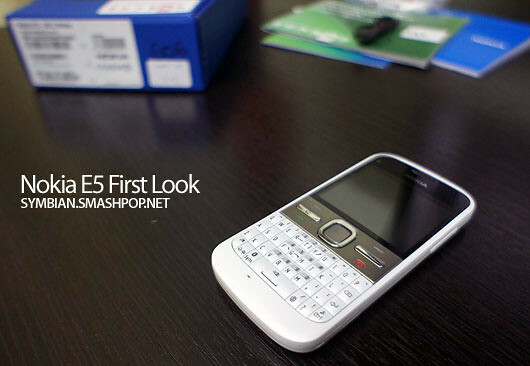 Ani from s60blog has posted up an unboxing video of the recently announced Nokia E75 along with some photos. Did you know that Nokia E75 is the first Eseries that supports N-gage gaming? It also comes with Nokia Messaging service for slick email HTML email support. Plus it’s packing a 3.2 megapixel camera with autofocus, high speed HSDPA access, integrated A-GPS with Nokia Maps, and a music player with a 3.5mm standard audio connector. Oh btw, here are some photos by Ani. I found 2 somewhat related videos on Youtube. Video 1: Taiwan students doing dragonball performance at the recent Nokia 5800 Xpressmusic event held at their university. 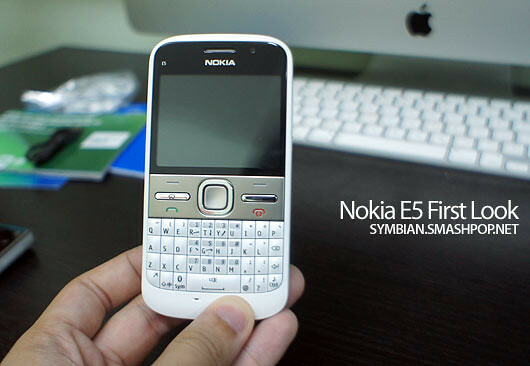 Video 2: An unboxing video of the Nokia 5800…. Woot! I’ve got my N96 today, courtesy of Nokia. Been waiting for it to be mine for so long since February and finally got it. It’s still charging so I havent got to play with it yet… but you can read the N96 reviews I did before this. For now, let’s watch the unboxing video I did just now. Neil from iGadget Life just got himself a presale Nokia N78 and he posted a video of him unboxing it. See how the new Symbian OS has improved… I super love the fade in and fade out menu animations and the auto rotate now is also animated! Check it out and you’ll know what I mean.